The relocation of B.C.’s most notable art school yields opportunity not just for employees and students, but developers as well. Emily Carr University of Art and Design’s move from its longtime home on Granville Island to 520 East 1st Avenue will be a “catalyst” for the industrial area, said Ana Maria Llanos, project architect. The new campus, which cost $122.6 million to construct and boasts 289,730 square feet of learning space, had its formal ribbon cutting last month. The four-storey structure is designed to achieve LEED (Leadership in Energy and Environmental Design) Gold certification and complies with the Wood First Act. Llanos and Ron Burnett, president and vice-chancellor of Emily Carr, suggest the move has been a beacon for building. 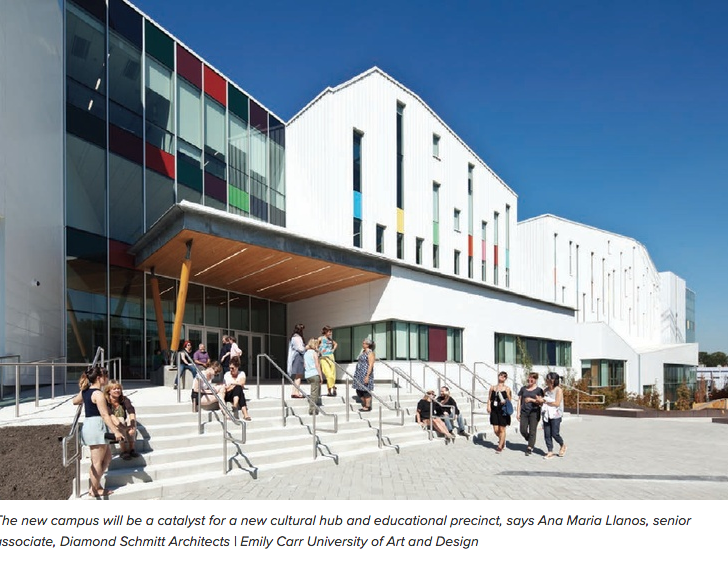 “The arrival of Emily Carr University of Art and Design has triggered the development of two private-sector buildings totalling over 250,000 square feet in area,” said Llanos. Nearby, industrial sites in East Vancouver have been sold at very high value in the last five years and many new developers are opening warehouse space paired with functional office space. Vancouver-based gaming and tech companies may be magnets to the area, uniting education and industry. “There is a new building going up in front of us that is full of tenants that are in the industries connected to what we do, so there will be a lot of synergies there,” said Burnett. In August, three adjacent lots in East Vancouver sold for $22 million. The buildings hold more than 15,500 square feet of leasable area. According to Avison Young, market activity in the Mount Pleasant and East Vancouver areas are expected to remain strong over the next year. “By virtue of the fact that we are here … all this new building activity, which will be in the hundreds of millions of dollars, is being generated by our presence,” said Burnett. Emily Carr has approximately 2,000 full-time students and 3,000 part-time with 25% of those students being international. The school is already in negotiations to build on-campus housing for students, but, for now, Burnett is enthused at the promise the new campus holds for the greater community. On September 5, Llanos and her team helped unveil the project to the world. Earlier this year, Diamond Schmitt opened its first Vancouver practice, at 1500 West Georgia Street. Llanos was appointed leader of the West Coast team.